Introduction: There is a growing interest in single incision laparoscopic surgery (SILS), and SILS cholecystectomy is now being routinely performed at many centers. There is as yet no larger series comparing SILS cholecystectomy and standard laparoscopic cholecystectomy in the pediatric population. We hypothesize that there is no difference in operative time, blood loss or post operative complications between these two methods. 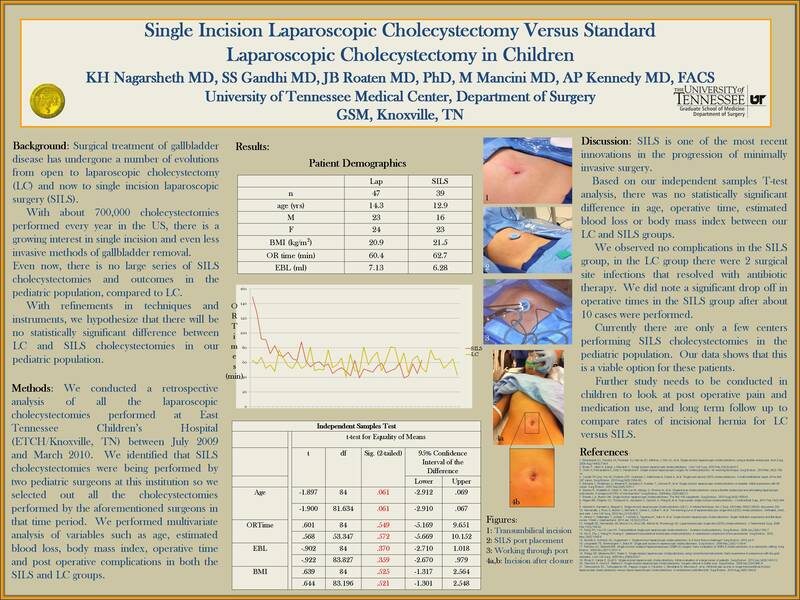 Methods and Procedures: We conducted a retrospective analysis of all the laparoscopic cholecystectomies performed at East Tennessee Children’s Hospital (ETCH/Knoxville, TN) between July, 2009 and March, 2010. We identified that SILS cholecystectomies were being performed by two of the four pediatric surgeons at ETCH and so we selected out all the cholecystectomies that were performed by these two attending surgeons in the aforementioned time period. We then compared variables such as age, estimated blood loss, body mass index, operative time and post operative complications in the SILS (n=38) and standard laparoscopic (n=47) groups. Statistical analysis was conducted using SPSS 16.0. Results: After performing independent samples t tests and Mann Whitney U tests, we found no statistically significant difference in operative time, estimated blood loss, body mass index or age between our two study groups (p < 0.05). Conclusion: This data reveals that SILS cholecystectomy requires no more operative time, and has no more post operative complications or blood loss than standard laparoscopic cholecystectomy. SILS cholecystectomy is a feasible alternative to standard laparoscopy in the pediatric patient.